Gotham 5.5: “Pena Dura” Review – Eggplante! 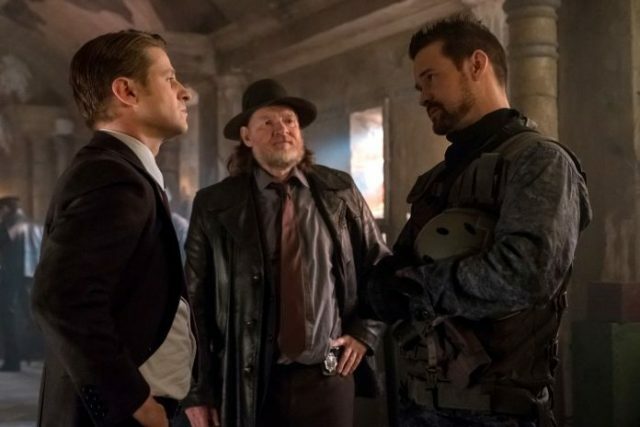 Gotham’s final season really started to come together with its standout previous episode, and much of the thrills remained intact in the following offering. “Pena Dura” finally introduces us to the Gotham universe’s take on beloved Batman villain, Bane, though at this point, he’s merely Eduardo Dorrance, an old army buddy of Gordon’s. Bane’s birth name is unknown in most variations of DC media, though his name in the Gotham universe appears to be a loose reference to Edmund Dorrance, a.k.a. King Snake, another DC villain that was later revealed to be Bane’s father in the printed panels. King Snake doesn’t appear to exist in the Gotham universe, but the ‘Eduardo Dorrance’ identity is a neat nod to Bane’s comic book heritage nonetheless. There wasn’t as much mystery to chew on in the latest offering of Gotham, since we now know that Nygma was the one behind the destruction of Haven, and while there’s more to this story, there doesn’t appear to be enough episodes in the season to really let this fact simmer. Much of the episode involves Gordon, Dorrance and Penguin all chasing Nygma, while Nygma himself tries to stay one step ahead of his pursuers, on top of trying to figure out what could have compelled his Riddler persona to kill all of those people at Haven. The Bruce/Selina subplot is still mostly in effect as well, though it didn’t amount to much this week, as Bruce is simply left to mope over Selina being far more alright with killing someone than he was. The result is a mostly decent episode that can’t quite match the momentum of its predecessor, but is still pretty entertaining nonetheless. Nygma’s Riddler persona taking over at key moments to ensure his survival is pretty thrilling, even if luck seems to equally play a part in helping him escape in certain instances. Nygma getting away from Gordon and Dorrance with an initial explosive trap is pretty cool, forcing some quick thinking and reflexes on Gordon’s part to try and save both himself and his old army buddy, but a later sequence where Nygma is captured by some random rednecks feels like it’s just filling up space, even if the rednecks being motivated by a dog being killed at Haven, not a person, is at least fairly funny. Obviously, it all comes down to the latest inevitable Riddler/Penguin confrontation, and it’s not long before Nygma finds his way back to his old villain chum. As you can imagine however, Nygma’s flashes of Penguin promising to, “Fix” him are not what they seem. Penguin reveals that he actually sent Nygma over to Hugo Strange, after discovering him with the stab wound sustained from Lee Thompkins in the Season Four finale. 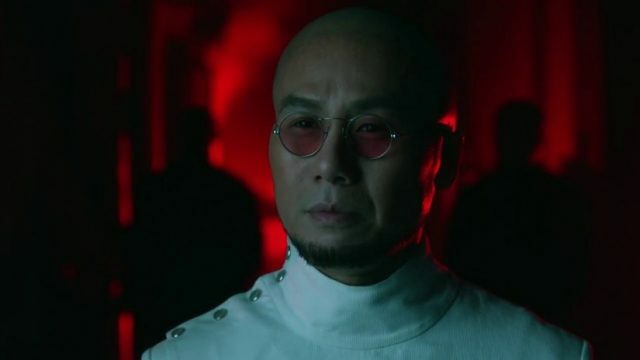 We still have no idea what the hell happened to Lee, but it’s nice that Gotham is finally acknowledging the Season Four finale’s events with Nygma and Lee again, even if it seems like the sudden impending cancellation of Gotham forced the show’s writers to condense what they originally planned to develop from that twist. Nygma does eventually make his way back to Hugo Strange as well, and after some weird science, Strange reveals that there is a chip in Nygma’s brain, and he’s actually being controlled by some other third party. Yes, if you really think about it, Nygma blowing up Haven, even in his Riddler persona, doesn’t really hold up to scrutiny, even if that’s partially what made it so interesting to think about. The fact that the show presents an initially interesting twist, only to fall into a subsequent twist that fans would definitely expect however, is a little disappointing. It turns out that Dorrance is the mysterious third party controlling Nygma, which will be incredibly obvious to anyone who knows that Dorrance is supposed to eventually become Bane. Apparently, Secretary Walker, Gordon’s secret ally in the U.S. government, is using Dorrance and his Delta Squad to carry out some sort of secret operation in the ruined Gotham City, and destroying Haven was somehow part of that. 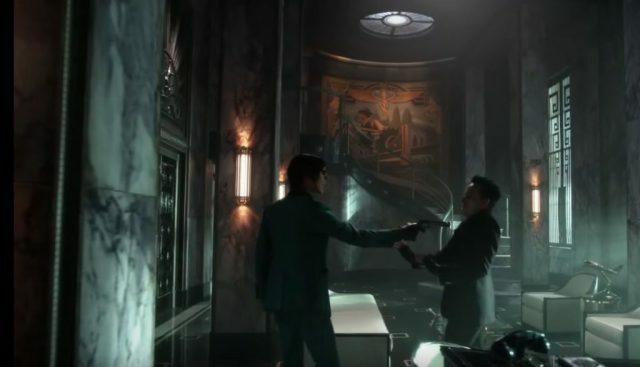 Gordon manages to get away from Dorrance after this reveal, after refusing to kill Nygma, which leads to Dorrance commanding Nygma to go after Gordon and kill him. Why Dorrance is commanding the guy he’s supposed to kill to hunt down Gordon is a bit of a head-scratcher, especially since Dorrance clearly has the resources and training to just take out Gordon by himself, but I guess the show wrote itself into a corner. Nygma obviously has to survive in order to menace Batman as The Riddler in the near future, after all. Regarding the continued developments with Bruce and Selina, they don’t make much forward movement in this episode, sadly. Instead, it felt like the episode just had to fill some story gaps this week, since Bruce takes a trip to Sirens in order to talk to Selina about killing Jeremiah, only to have Selina tell him that she doesn’t feel any remorse. Selina subsequently confessing that she was present during the murder of Bruce’s parents should have been a fairly significant moment too, but it kind of falls flat here, since nothing ultimately results from this revelation. All that happens is Bruce later talks to Bullock at the GCPD office, whereupon Bullock tells Bruce that he also worries about there being no good left in Gotham City, but they both must nonetheless carry on act by act, and deed by deed, because the little things matter. This was a great character moment for both Bullock and Bruce, especially since it’s something that Bruce will inevitably take to heart for his rapidly-approaching tenure as Batman. I just wish that more was done with this subplot beyond a pretty speech. Still, the thrills stayed strong in, “Pena Dura”, even if not every story development lived up to its potential. Oh, and on that note, I should probably mention that Jeremiah survived being stabbed repeatedly by Selina during the previous episode, thanks to body armour. Okay? This not only deflates the Selina drama quite a bit, but also more or less undoes Bruce, Alfred and Selina discovering the whereabouts of Jeremiah in the first place. Why bother having that happen, if this was the immediate result? Regardless, the introduction to Dorrance did make a decent impression, even if his villainous heel-turn was a bit rushed (though I doubt Gotham/Batman/DC fans will care, since FOX already confirmed throughout most of this season’s marketing that Dorrance is the Bane of the Gotham universe), and Nygma being a patsy in a mysterious government agenda is something that could be promising, especially when Penguin will inevitably be drawn into this rogue operation as well. It’s too bad that Gotham couldn’t completely maintain the especially impressive momentum from the previous week, but it looks like the villains will nonetheless have plenty to do in the weeks ahead, especially with the real threat to the ruined Gotham City now finally being revealed at last. Gotham keeps the excitement going strong in, "Pena Dura", even if the storytelling doesn't quite manage to keep pace.